A recent announcement by Chinese officials that Ghana will release Chinese citizens detained for illegal gold mining and grant them a safe return to China seemed to end that crisis. In fact, Chinese are still in hiding, the issue of illegal gold mining by Chinese in Ghana has not been resolved, and tensions continue to increase between China and African countries with heavy Chinese investments, interest, and influence. Most of the information about the arrest of the Chinese miners comes from three sources: the Chinese community in Ghana, the Ghana authorities, and the Chinese authorities. All three sources agree the reason for the crackdown is the small-scale gold mining by illegal Chinese immigrants—foreigners, much less illegal immigrants, are not allowed to do this type of mining. Chinese miners have complained about suffering violence and robbery from the military, the police, and other, unidentified personnel, which the government of Ghana denies. Many miners are still in hiding, worried for their safety and their lives. They have also complained that the Chinese Embassy hasn’t given them enough help—if it offered any help at all. There have been more problems with the gold mining besides the immigration status of the Chinese miners. The Chinese have tended to hire their relatives and friends from China, also illegal immigrants, instead of locals. When locals are hired, they are paid much less than their Chinese co-workers. Ghanaians have also complained about the water and land pollution caused by the mining. The tension between the Chinese miners and locals, some of whom are gangsters, has been so high that many miners purchased weapons on the black market for protection. Individual illegal miners are hardly the only problems involving China in Africa. In Ghana, six large Chinese companies legally mine gold there. In other African countries, more Chinese state-owned companies work on oil fields, construction sites, and in other enterprises. 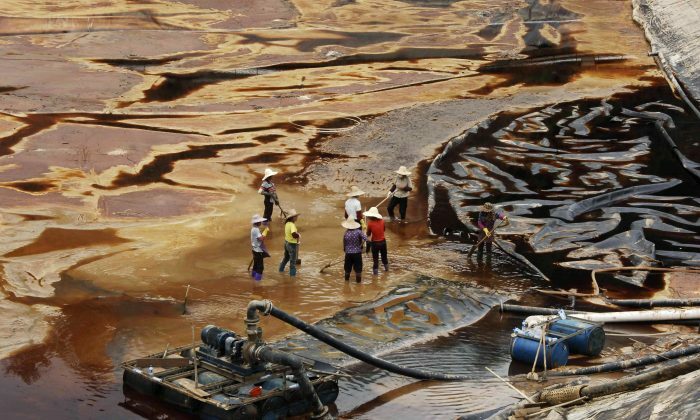 These large Chinese companies have been accused of abusing labor rights and causing environmental damage. Chinese companies and individuals, legal or illegal, are not intentionally doing this to African countries. They have been doing things this way in China for several decades. They actually don’t know any other way. Take as an example the Chinese gold miners in Ghana. Most of them are from the same area, Shanglin County in Guangxi Province, which shares a border with Vietnam in southern China. Shanglin is a place with very limited farmland but is rich in gold. The Shanglin people have had a tradition of gold mining for generations. During the 1990s, when Shanglin’s gold was depleted, Shanglinians migrated to other areas, mostly to Heilongjiang Province in far northeastern China, to continue their gold prospecting and mining. Their business practices in Ghana are just the same as they were in China. According to China Daily, the main reason for the crackdown is probably the Chinese miners’ lack of legal awareness. This is probably true from the surface. But, except for the issue of their illegal immigration to Ghana, their behavior in China was the same. Why didn’t they get into trouble in China? For the past 30 or more years, since the reform and opening up led by Deng Xiaoping, economic development has been the only criterion in China for evaluating the performance of state and Party officials. As long as the work brings in wealth and high GDP figures for the local government and also lines the local officials’ pockets, then water pollution is no problem. Destroying the land is no problem. Laws and government regulations are no problem—they can easily be solved by bribery. That’s how business is run in China. That’s what the “China model” is all about. The China model is based on three costs: sacrifice of human rights, including labor rights; depletion of natural resources; and damage to the environment. In China, independent unions and organizations devoted to labor rights are not allowed. This has helped make sure that China’s labor costs are the most competitive in the world. There are also millions of no-cost, forced laborers in Chinese jails and labor camps. Other examples abound. The Tibetan people believe that mineral resources are the property of Buddha. They thus cannot be dug, especially those under the sacred mountains. For many years, Chinese state-owned mining companies have been doing destructive mining in Tibet, including using explosives in the sacred mountains. When the Tibetans try to protest, they have been ruthlessly put down. According to the Tibetan writer and activist Tsering Woeser, in the towns of Chamdo, Maizhokunggar, Lhunzhub, Dagze, and Namling, many Tibetans have been arrested or sentenced to jail terms for protesting against the mining in their sacred mountains and against the pollution of their sacred rivers and lakes. In several incidents, protesting Tibetans were shot to death. In Inner Mongolia, at least two nomads were killed for protesting coal mining and pollution. In China, 118 cities have been identified as having economies relying primarily on the exploitation of natural resources. As of 2009, 45 of them have been designated as resource-exhausted cities. The actual number could be higher. Regarding water and air pollution, after the experiences of the last couple of years, many Chinese people have become self-taught experts in environmental science. The China model is not the Chinese way. In traditional Chinese culture, human beings should live in harmony with nature. That’s why after 5,000 years of civilization, China’s environment and natural resources were mostly well-preserved—until the Chinese Communist Party (CCP) took over in 1949. The CCP advanced the concept of conquering nature. One of Mao Zedong’s favorite mottos was “To fight with the heavens, earth, and human beings, the enjoyment is boundless.” The large-scale destruction of nature began in 1958 when Mao initiated the Great Leap Forward. Over the past 30 years, the situation has become much worse, not better. When people outside China have talked about the China model, they often forgot to mention the model’s requirements. All workers’ rights organizations and any independent labor unions must be banned. All land must belong to the state and be traded for profit by the state, state officials, and their families. In order to avoid criticism and monitoring, all environmental groups must be banned. All of the media must be controlled to ensure no victim’s voice can be heard. All religions must be co-opted. Individual conscience is then no longer an issue, and most of the population will accept that money is the only thing that matters. Last but not least, the regime needs to build enough jails and labor camps to make sure that whoever protests will be put behind bars. To be able to do that, one also needs to have a servile legal system that follows only the CCP’s policy and totally ignores the laws. How many countries are able to meet the requirements for copying the China model? Whether the Chinese regime’s push out into the world goes by neo-colonialism or some other name, its power is expanding around the world. On the one hand, this destructive expansion will continue with or without illegal miners in Ghana. On the other hand, the China model will meet more and more resistance. The pushback in Ghana is certainly not the last case.